If you're the kind of person who never knows what she's going to find when she steps outside of her farm shack—and therefore has tremendous difficulty making deadlines, keeping appointments, and planning pretty much anything in advance—the idea of participating in a virtual book tour for one of your favorite authors is very appealing, especially if the date is a couple of months away. There's no pressure, no need to leave the farm, no way that even someone as terrified of commitment as I am could screw this up. And then last Friday a big storm blew through and knocked the power out—and it still hasn't come back on. It's never stayed off this long before. Apparently 100 poles on our electric service line went down, and it's going to take a while longer to put them back up. Our day to day life, which often feels remarkably similar to camping, is now even more so, except with freshly picked lettuce. We grill dinner, heat water on the propane stovetop to do dishes, and are bathing in the creek. It's getting pretty old, but things could be a whole lot worse. 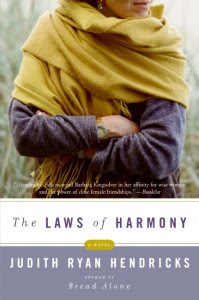 I hope to be plugged back in and catching up with everything online soon, so check back for my review of The Laws of Harmony (which I loved by the way), along with a chance to win a signed copy. In the meantime, the next book tour stop will be at Peeking Between The Pages on Monday May 18th, and you can find a list of the entire book tour for The Laws of Harmony here. © Copyright 2009 FarmgirlFare.com, the candle-lit dinner and early to bed foodie farm blog where it's always nice to have a long distance best friend willing to step in and take dictation for a blog post over the phone when you suddenly find yourself powerless. I had a feeling something was going on after the big storms. I wish I were somewhere near you to help out. Wow sounds like great camping to me..have fun and be safe..
Oh, no, you *know* a solid date or deadline is when you'll have a farm emergency, every time. Got a wedding to attend? The mare will have a difficult birth. Going to a convention? Some canid attacked the livestock. Got a hurricane predicted to blow through sometime in the next three weeks? Power will pre-emptively go out for several days when the sky is still clear and blue. (Oh, wait, you're in Missouri. Make that "hurricane" into a "tornado.") And the livestock will refuse to drink the rainwater, when the rain finally does come, preferring to dehydrate rather than drink something inferior to their well water. ...you don't think maybe I've run into a few timing issues, do ya? What about the freezer - do you have a backup generator so food doesn't spoil? Well I'm glad your ok. I can't imagine no power for more than a week! And thanks to your friend, I'm glad she was able to step in and post for you. Oh, I'm so sorry about your power! The same storm landed three trees on my brother's house and uprooted my father's beloved pine. When the ice storm wiped out our power here in Maine, I made Irish Soda Bread on the woodstove. And if your asparagus is still coming on, nothing is sweeter than a few spears caramelized on the grill. i am new to your blog, but i am just loving it! this and your "kitchen garden"
I can't wait to follow your daily activities!!! hope you get power back soon! Can't wait to hear about the book review. Stay warm and dry! Bless you! I hope you are having mild temperatures during the day and cool nights. (It is in the nineties down here near the Texas coast.) Camping out should be a choice. I'm sending postive thoughts your way. I ordered the book from Amazon. What I'd give to live on a lot of land with your beautiful animals. I'm live in North Georgia Mountains and wish I'd bought land when I moved here. I just returned from Atlanta and bought ingredients to make the lemon and coconut bread. Yummm. I read your update on Friday, and decided that I'd try to make bread in your honor. So yesterday I made 2 kinds, both "real" breads with yeast & rise times & everything. I hope you get power back soon & can give us an update on the bakery building construction. The bread I made turned out well (one kind was definitely better than the other) so I'll be looking for more recipes on your site. Well if anyone could handle it, it would be you! At least you know it's temporary. I look forward to learning more about these books. Hi CJ,Beth is a real lifesaver and a great all around pal, though sometimes it's a teeny bit odd to have a best friend you've never actually met in person! Don't stop the music! Keep writing to us, Thank heavens for all the heart wrenching wonders, of baby animals being born and the muddy sod paths that trail boots are made for. I totally sympathize! Have lived through hurricanes and typhoons that knock out the power and water for days or even weeks at a time. I hope you have all your essentials back soon! Take care!